There can be few artists attempting to bridge cultures through the power of music with quite the same impact as Adil Hiani. The Moroccan artist has been on a mission to unite the sounds of Western electronics with the traditional folk music of his homeland since 2009, when he helped launch Cosmo Records from his base in Casablanca. Since then he has rapidly developed both as a label manager and as an artist in his own right. He first found notoriety in Morocco from an early age, learning the trade as a DJ thanks to his cousin DJ Key, one of the leading lights in the country’s hip hop scene. From 2003, at the tender age of 14, he was regularly touring and refining his scratching and beat-juggling skills, and within a few years he had branched out to try his hand at production. Once the internet became more widely accessible in Morocco, his natural appetite for new sounds led him to discover all kinds of music, from jazz to blues and unsurprisingly on to electronic music. Early dalliances with funky house found him plenty of gigs, but as his knowledge and taste deepened towards more experimental kinds of club music, he quickly moved beyond the interests of the crowds he was playing to. The online connection provided the only outlet for his music for a number of years, while he refined his production skills and reached out to portals that might be interested in hosting his mixes. It was through this determined networking that Laurent Grumel, a Frenchman in Morocco, discovered Adil’s sound and pitched the idea for a record label that combined contemporary electronic artists with local Moroccan musicians in a cross-cultural collaboration, and so Cosmo Records was born. Alongside Driss & Mehdi they launched the project by inviting Argenis Brito to Casablanca to record the first release in the summer of 2009, and so the label grew from there to work with Masomenos, Rene Sandoval and Philip Bader, and Pier Bucci. Due to his location, international bookings were a challenge for Adil due to visa complications, until he moved to Toulouse to study in 2011. As a result of the connections he had forged through the label work, gigs soon materialized alongside Sonja Moonear and Dandy Jack in Lausanne and Geneva, and then across Europe from France and Spain to Italy and Greece. One of the defining gigs of this phase of his career was being invited to play the infamous Club Der Visionaere in Berlin in 2013, where he ended up playing for 11 hours straight. After three years living in Europe he ended his studies and returned to Casablanca to focus on developing his own music production as well as the sound of Cosmo Records. The label released its most ambitious project to date in 2015, celebrating five years of operation with artists such as San Proper, Radiq, Dandy Jack and Yapacc collaborating with Moroccan players such as Khansa Batma and Saad El Bouaamri. With his own productions sitting comfortably alongside these celebrated musicians, Adil continues to expand as an artist in his own right. 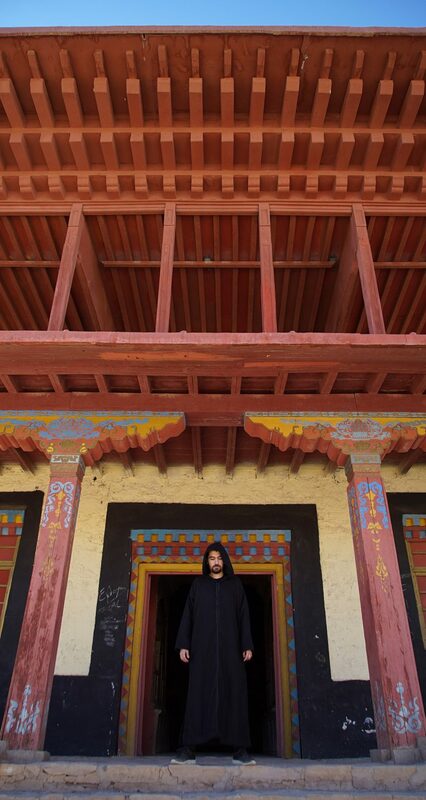 Rather than lazily dropping samples of African and Eastern music into formulaic house and techno structures, he pushes his craft to deal in rhythmic arrangements influenced as much by the Far East as the music of his own country, seeking to create a true fusion of Eastern and Western cultures grounded in an innate understanding of sounds from all over the world. In this way his sonic identity goes against the grain, driven by an unquenchable passion for meaningful musical experience even when he could have taken an easier road to success a long time ago. Founded in 2009, Cosmo Records is a Moroccan electronic music label desiring to create touch points between Western, West-African and Oriental music. Owing to its unique creative process, the label is seeking to spearhead a revolutionary form of blending various musical spectrums. In so doing, world famous electronic artists and traditional musicians meet in Morocco’s finest music studios to produce original sounds at the confluence of music styles ranging from minimal, tech house and house to the psychedelic practice of Bamako’s Kora. Artists are brought from a wide diversity of backgrounds, which makes any track of the label’s music a fascinating journey where experimental sounds coming out of the most technical devices keep echoing traditional ambiences. More than anything, Cosmo records acts as a bridging artist community fostering the dialogue between sophisticated western music and ancestral afro-oriental sounds. That undoubtedly gives the label’s universe its unique touch. The Cosmo touch.